This was one of the best holidays we have ever had! It was a 7-day trip in a group of 8 people, all of whom are funny, interesting and open-minded - the best ones to have unforgettable holidays with! Slovenia's beautiful. Julian Alps are breathtaking. Simply unforgettable experience. Wonderful mountains, emerald-green Soča , lovely weather, friendly people - I could count for a long time. We stayed in Tolmin-Gabrje at Apartma Denis . There are several apartments in the house, all well-equipped and clean. Dishwasher was in only one apartment. Apartma Denis are located in quiet village and you would need a car to get around. But we liked the place a lot - if you're into peaceful location close to hiking trails, this one's perfect . We had a chance to climb KRN - 2244 metres. We started hiking from Lepena Valley . The day was hot and sunny. We were all in very good moods. There were lots of cows on the route which made the trip even more funny. Once the animals even forced us to stop walking - they were climbing down and didn't leave any space on the path for us. Taking advantage of our forced break we had a quick snack and took some photos. Getting to the mountain hut on KRN took us about four and a half hour. The final part was quite steep and demanding . 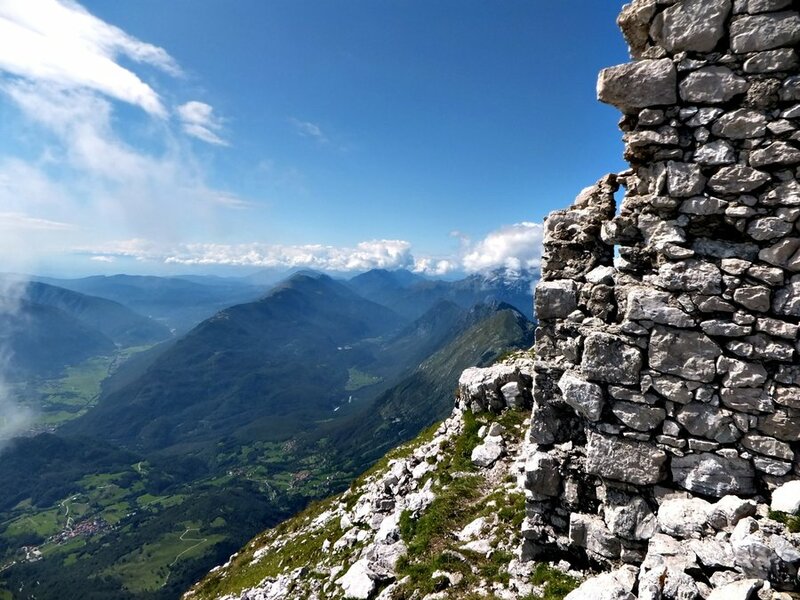 I was relieved to reach the hut and have a break admiring stunning view of Julian Alps. Then, we continued climbing up along a rocky path and after about 15 minutes got to the peak where we sang "Happy Birthday" to one of our friends 🙂 We hanged around on the peak for quite a long time - lots of space, great views - what more could we ask for? Finally, we started climbing down along the same trail. Getting to Lepena Valley took us about 4 hours. It was tiring but very rewarding hike. Another mountain which we climbed was Krasji vrh - 1773 metres. We started hiking from Kobarid . The trip was very interesting - we passed many caves and remainings of war fortifications . Getting to the peak took us over three hours. We could have got there quicker but we were enjoying ourselves and checking the caves we passed by. When we were very close to the peak, it started to rain. Half of our group decided to retreat. But not us! And it was worth it! After a while it stopped raining, clouds went away and we were rewarded with amazing sight of Julian Alps. I was so glad that we had decided to continue hiking despite the heavy rain! The only thing that wasn't so great was huge amount of animals' droppings on the peak... Apparently, Krasji vrh serves as pasture for goats and sheeps . The other day we wanted to accompany our paragliding friends on their flying adventure so we went to Lijak . Our friends got to the paragliding starting point by car but we decided to hike. I regret this decision until today. The trail to Lijak was abandoned and weedy and rather difficult to find. We could easily guess there was hardly any people hiking there. In addition, there were no views to admire, just dense forest. I wouldn't complain about this thing if it didn't turn out that the forest is a tick's paradise ! It seems those blood-sucking little bastards love Lijak bushes - together with Bartosz we caught 8 of them! I'd really advise against hiking to Lijak's top . By the way, to make matters worse, we were late for our friends take off. Fortunately, we got a chance to admire other paragliders. There were loads of them! Slovenia is famous for its good paragliding weather conditions . Staying in Soča valley and not trying water sports would be a mortal sin 😉 We decided to give a try to canoeing . We rented 3 rubber canoes. Of course, Bartosz fell into the water at the very beginning of our adventure. Not long after that my canoe also turned upside down and all 3 people on board, myself included, went down into deep and cold water of Soča river. At first I got scared because the current was quite strong and we collided with a bridge! But we were all fine. I have to admit I even enjoyed the refreshing bath. We were laughing and catching happily the floating bottles of our drinking water. Another thing worth mentioning is Postojnska jama (Postojna Cave). It's one of the biggest caves we have ever seen . Very beautiful, with enormous hall in which concerts were given in the past! The cave is so big that there is special narrow-gauge train which took all visitors into the deepest part of this place. Simply amazing place. Tickets were not cheap but definitely worth it! Besides visiting the cave, we decided to have a look at the nearby castle - Predjamski Grad . Unfortunately, this one isn't worth visiting. It may be quite impressive from the outside but inside it's empty and boring. Not worth the price of the ticket for sure. What I need to mention about Slovenia is its great wine and food. Slovenes cultivate grapes in huge quantities and they make really good wine. And it's so cheap - you can get a bottle of lovely wine at 3 EUR (2014 data)! We also had a chance to taste REAL cheese made in the moutain hut. You could imagine how tasty it was and so different than the cheese you buy in supermarket. And you, have you ever been in Slovenia? What did you do there?